Since we first reviewed an IOR scope, the 2.5-10x42mm, we have been very impressed with their optics as well as their durable scope design. We have wanted to get our hands on some more IOR optics for review and were presented with the opportunity here with their fixed 10x56mm scope with their illuminated reticle feature. This scope is a fixed 10x scope and as such is in a bit of a different market than the variable power 2.5-10x that we reviewed last time. This scope is a brand new scope purchased through a retailer and should be a good representation of the current series of scopes has to offer as the last one we reviewed was an older scope and the newer version of that same scope has had some improvements and changes made to it over the years. The IOR scopes tend to be a really nice higher end scope built with very good construction, and this scope is no different. The overall appearance is of a very functional and durable scope and this seemed to be the case during our testing. The finish is a nice matte finish that is even and appears to be quite durable and functional. The literature that came with the scope said that is had a one piece steel tube, and while it felt heavier than aluminum, a magnet did not stick to it, so it may be some sort of Steel Alloy. Either way, the tube is of a durable design and whether it is a steel alloy or aluminum, it will be quite durable over the long haul. The eyepiece on the scope is a fast focus design and adjusts very smooth through out the range. 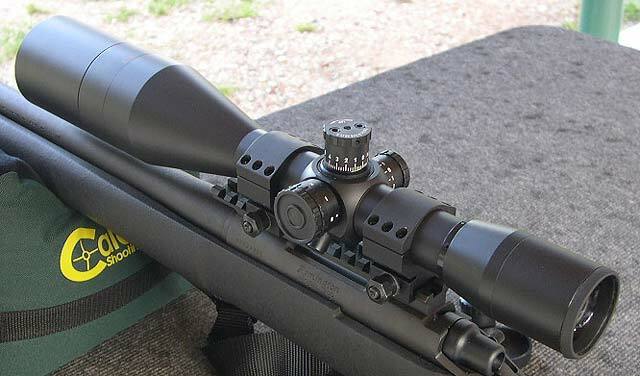 The entire ocular eye piece rotates when adjusting it, so you’ll want to get it adjusted and then put on your flip-up scope caps. The dioptre range is from -4 to +4 which should take into account just about everyone’s eyes. The scope also comes with a sunshade. This scope has an illuminated reticle, and do not be fooled by that knob on the left, it is only for adjusting the brightness of the reticle and not for adjusting the focus or paralax. The reticle is nicely lit and there are 7 levels of brightness for the reticle and an off setting. This reticle is their MP8 Dot which has the dot at the very center. Each full size hash mark is a single MIL and the smaller hash marks are half a mil. Another nice thing about this reticle is the very wide hash marks on the lower verticle stadia that indicate 10 and 20 MILs. 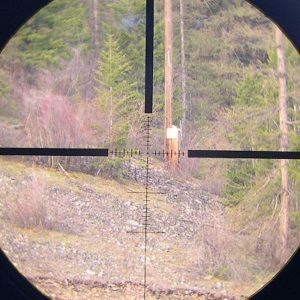 The standard MP8 reticle has become a favorite for many snipers out there and other manufacturers have copied it, such as the Falcon MP20 reticle. A picture of the lit reticle is below. The windage and elevation knobs are a tall turret design and have complete dust covers over the knobs. The top of the knob is nicely knurled to provide good gripping in all weather conditions. The clicks are very positive and have very good tactile feel as well as a nice audible indication that is not exactly a click, but somewhat muted. It is kind of hard to explain, but nice. There are 15 MOA of adjustment per revolution and this scope has .25 MOA per click adjustments. The same scope is also available with .5 MOA clicks as well. Typically with 30mm tubes you will get a good amount of adjustments and this scope does offer some good numbers with the factory figure for total elevation adjustment being at 90 MOA and our test scope here had 87 MOA of actual elevation adjustments. There are horizontal hash marks under the elevation knob that are fairly easy to see in order to indicated how many rotations you have dialed into the elevation knob. Though there are no direction indicators that are visible from behind the scope. The Windage knob is pretty much the same as the elevation knob, except it does count up in both directions which is a feature I do prefer. The overlap happens at 7.5 MOA which is a decent amount of windage adjustments before things get confusing by the overlap. There are hash marks beneath the windage knob as well. Both the windage and elevation knobs are resetable to zero. The objective lens is 56mm which is typically larger than I like, but I will admit, it does gather some excellent light. The optics on the IOR scopes continues to impress us as this scope is exceptionally clear and bright. Whatever arrangement they have with Schott in Germany, it is working. The glass on the IOR scopes is some of the best I have seen. The only downside is that this particular scope has no parallax adjustment (adjustable objective). For a high end scope I would expect some sort of PA, but I did shoot this scope out past 400 and there were no issues there nor where there any problems getting a good picture at very long ranges out to beyond 1000 yards, but it could have been even more crisp at longer ranges with a adjustable objective. It is impressive that the image is clear and sharp at such a wide spectrum of ranges, though I would still prefer an adjustable objective. 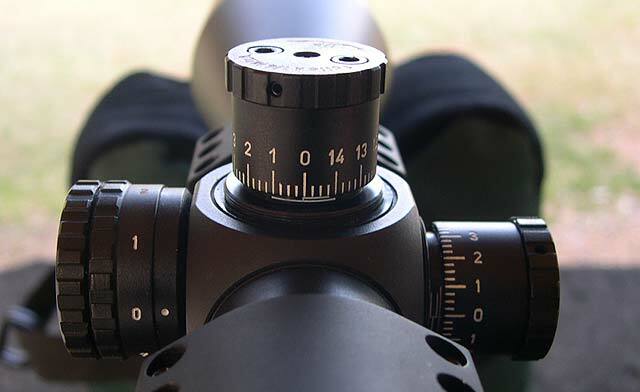 I will also note that IOR does make another fixed 10x tactical scope with a side focus knob. We mounted the scope onto our Remington 700 .308 test mule tactical rifle with a set of Medium Burris XTR rings and headed out to the range. 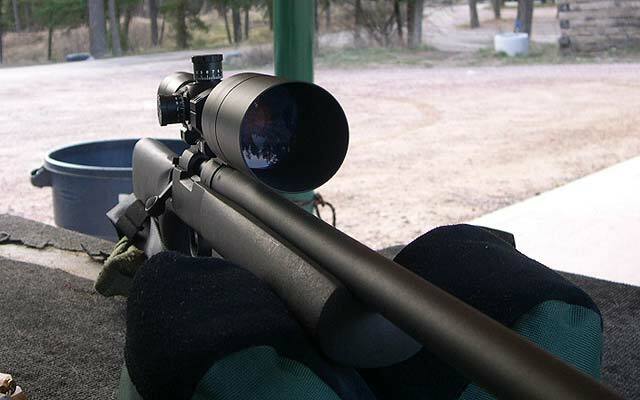 The scope has very nice eye relief; the factory lists it at 3.75″, which will help for shooters with magnum rifles. The fast focus eye piece was quick to focus and did a very nice job. The optics, like I mentioned before, are excellent and after shooting the box with the scope the adjustments were verified as being accurate and repeatable. The Dot MP8 reticle is a little different than the standard MP8 and that little dot in the middle does make it easy in some cases to get a good aiming point. It is just a matter of preference of which you would prefer. I think I lean toward the traditional MP8, but many consider me old fashioned. 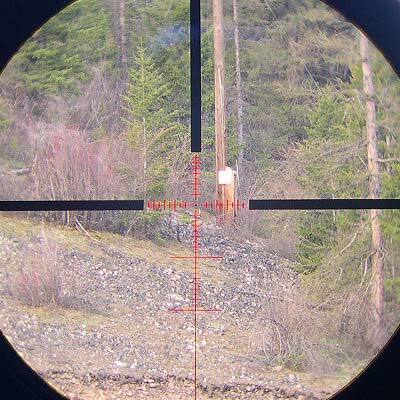 The illuminated reticle also worked well even on a bright day. Overall, does this IOR live up to the previous ones we have reviewed and used before? Yes, it really does. The more I use these IOR scopes the more I appreciate what they are doing and the quality. Some of their tubes and knobs are a little odd shaped, but the quality of the optics cannot be argued against, it is excellent. IOR is one of maybe 2 or 3 companies in the world that actually builds the entire scope in their own factories. Because of that they can do some unique things and be quick to bring new stuff to market. This scope is nothing new or fancy, but for the price it is a very good scope and will serve in a tactical role very well. Hi, stainless steel does not attract magnets. Every steel is an alloy of something. Good website, keep up the good work! I had heard that before, but have never heard definitively that it was the case. It seems I tried a magnet on SS before and it still stuck… but perhaps I’m mistaken. 400 series stainless steel is magnetic while the 300 series is not, or only very weakly so, depending on the exact type. All SS knives are 400 series as it is also hardenable, the 300 series cannot be hardened aka heat treatable. This is an older review but I’m considering this scope right now. Do you have any long term follow up comments on this optic? My instructor (from 2008) was a big IOR fan but I’m hearing a lot of negative info about the brand these days. Thanks in advance for anything you can share. Feel free to PM me if that’s easier. looks like the scope I want++++, and after having several failures with Vortex. I want a scope you can drop while attached to your rifle onto a hard surface and it continues to function properly. These cheap thin aluminum tubes and are unrepairable due to design type. Email me if interested in one. I recently took one off my 50 bmg for something with higher magnification. Eyes getting old and this scope has held up for over 10 years without one issue.